Wedgie's wonderful world: Here Comes Santa! I hope you are well and having a good week! Can you believe that we're into September already? Where is this year going? Well, in preparation for Christmas we have a new challenge for you at Christmas at Sweet Stampin this month! Hee, hee! I think this Santa might have spent far too much time at my house before Christmas....sampling some sweet treats! I've coloured my Digi Stamp Boutique image with my Promarkers and created my sentiment on the computer. My Christmas pudding is made out of scrap paper and has been adorned with red gems and glitter. Fabulous Christmas card Wedgie. I love the santa and the pudding! 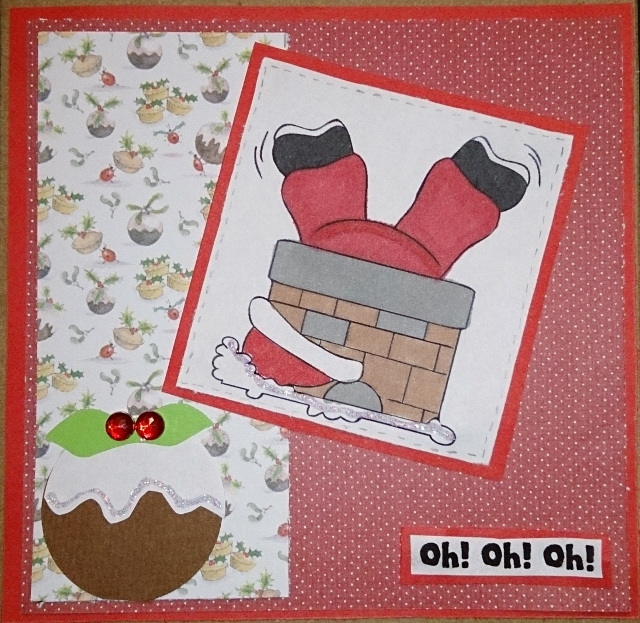 Fun card Wedgie, I like the santa the papers and the pudding. Fabulous and fun! Great Christmas card, Wedgie! Lol, I've just noticed he says oh oh oh!! Brilliant. I love this card! It still makes me giggle :) Your Christmas pudding looks fantastic! Great fun card .I love the play on words ho ho ho backwards for oh oh oh .gave me a giggle . fabulous and fun holiday card. What a beauty and eye catching details. Beautifully crafted. Thanks for sharing your talent with us at Tuesday Throwdown. We look forward to seeing you again.